Accessibility: the building, workshop space, and washrooms are wheelchair accessible; ASL interpretation has been confirmed, please contact us if you require this service by July 10th at noon. 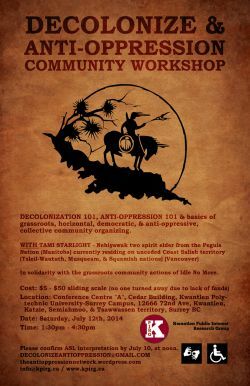 Taking place on unceded Coast Salish territory - Kwantlen, Katzie, Semiahmoo, & Tsawwassen nations. - the building, workshop space, and nearby washrooms are wheelchair accessible. - ASL interpretation is has been CONFIRMED. Please let us know if you require this service by July 10th at noon. - This space is also safer space = anti-oppressive.